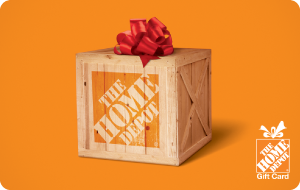 The Home Depot® is helping people do more with their hard earned money. From modest projects like updating your bath to small projects with a big impact like paint. The Home Depot can help you get more done in your home for less. That’s the power of the world’s largest home improvement retailer. The Home Depot. More saving. More doing. © 2018 Home Depot Product Authority, LLC. All rights reserved. Please allow up to 1 hour for activation before redemption.